Context: Listened to this in a day while chopping copious amounts of veg in the Wycliffe kitchens. Having read Vile Bodies, I was expecting something a bit more banal and pompous. But this was great. I loved it from the Prologue right through to the Epilogue. In Vile Bodies, the humour never really comes off. It’s a bit fragmented and surreal. It makes me wonder what happened in the two years between the publication of Decline and the later novel Bodies. 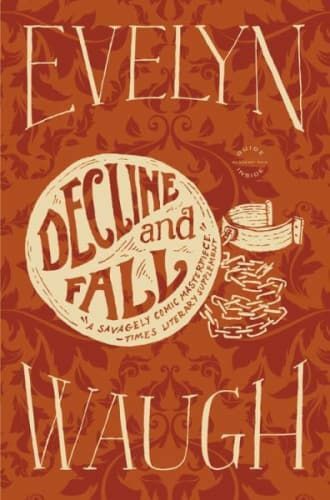 From the get go, Decline and Fall brims with superb satire. And it takes pot shots at the rich and lazy. Perfect! The protagonist is the most passive character in the book as he observes the monstrous culture around him and falls prey to their caprices and indulgence. But before you feel to badly for him, know that it’s all water off a duck’s back to him. This is sublimely made in the best passage of the book for me which comes near the end. In it, life is likened to a fairground attraction of the kind the Health and Safety brigade have killed off. The ride is one with seats all round a spinning disk. You can try to get on the disk and stay on it. If you reach the centre, you find a place where you aren’t thrown outwards by the force. You can either get on the disk and contribute to the hilarity or sit at the side and watch. This is sketched as an image of life. Some sit and watch. Others are determined to struggle to reach the centre. But once they reach it, they find themselves in much the same position as those watching, thus rendering their struggle pointless. I thought this was quite profound. Mr. Sniggs, the Junior Dean, and Mr. Postlethwaite, the Domestic Bursar, sat alone in Mr. Sniggs’s room overlooking the garden quad at Scone College. Then he turned out the light and went into his bedroom to sleep.